WHERE CAN YOU SEE THEM: With just 400-450 left, chances of spotting them are slim, but your best bet is off the Georgia/Florida coast in winter. The North Atlantic right whale is a baleen whale, using baleen bristles inside its mouth to filter-feed on krill by slowly skimming through concentrated patches at or just below the surface of the ocean. 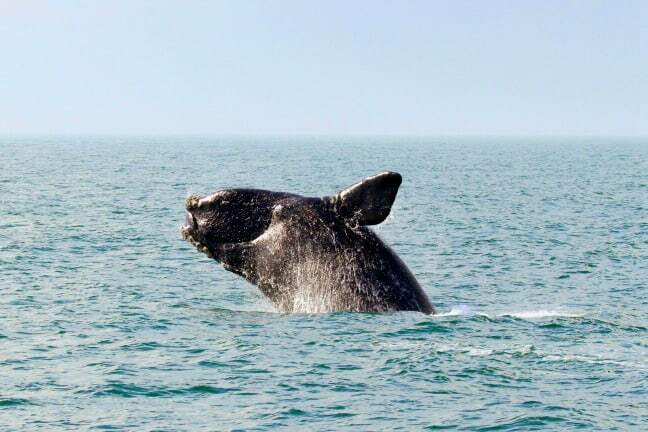 Like other right whale species, North Atlantic right whales can be identified by the callosities on their head, which appear white due to large colonies of whale lice; their long, arching mouths; and their broad backs, which lack a dorsal fin. Slightly smaller than their North Pacific right whale cousins, adults average 43 to 52 feet in length and weigh between 44 and 77 tons (or 88,000 to 154,000 pounds). 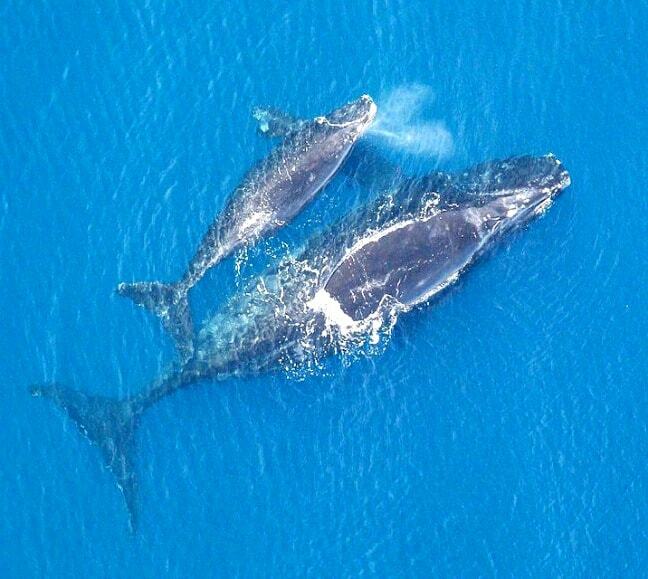 North Atlantic right whales make an annual migration from their feeding grounds in the Gulf of Maine to their winter calving grounds just off the coast of Georgia. These whales start giving birth at age nine or ten after a year-long gestation period, with calves ranging 13-15 feet in length and weighing around 3,000 pounds. Once their first calf is born, they continue to spawn every three to six years. Right whales were named as such because whalers historically considered them the “right” whale to hunt due to their slow swimming speed, surface-skimming feeding methods, docile nature, preference for living close to the coast and 40% blubber content (which means that they continue to float long after dying, making them easier for whalers to handle). They were hunted commercially for their meat and whale oil as early as the 11th century. But by 1935 there were less than 100 left in the world.The practice of hunting them was banned globally in 1937, yet there are still numerous threats that impact the North Atlantic population today. Chief among them are ship strikes (due to the whales’ preference for coastal areas with heavy shipping traffic) and entanglement in commercial fishing gear. What’s being done to save them? Thanks to conservation efforts, North Atlantic right whales have made an impressive comeback over the past 70 years, more than quadrupling their population. The whales are currently protected by both the U.S. Endangered Species Act and the Marine Mammal Protection Act. To address the ship strike issue, the East Coast has ship speed zones that remain active during the right whales’ migratory season, from November 15 through April 15. During that time, ships measuring over 65 feet are limited to 10 knots or less, which has lowered the whales’ ship-related mortality rate from an average of one per year before 2008 to just one in the last six years. There’s also a federal law prohibiting boaters from approaching within 500 yards of right whales, but this rule has attracted a lot of debate.